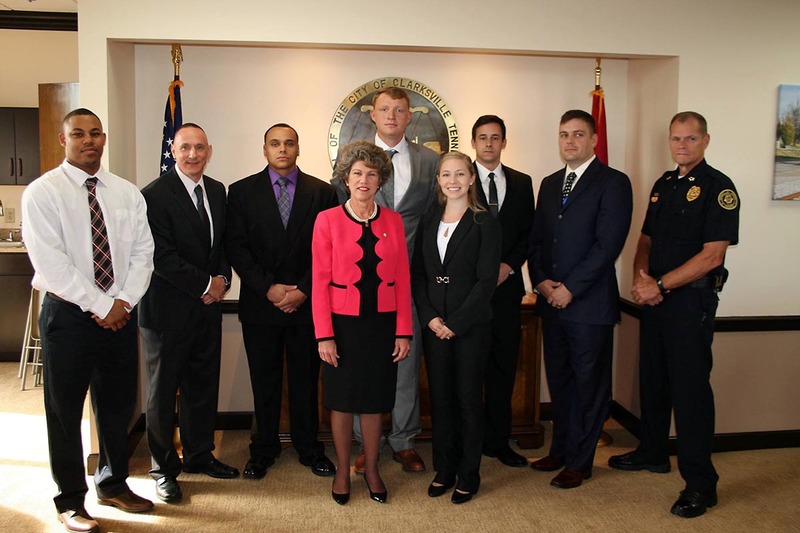 Clarksville, TN – On Thursday, June 1st, 2017, seven new officers were welcomed to the Clarksville Police Department family. They are Shavell Lucas, Robert Conery, Michael Hickmon, Thomas Harrison, Alyssa Wade, Nicholas Dejesus and ​Carl Jackson II. Clarksville Mayor Kim McMillan administered the oath to the new hires at One Public Square. There were family and friends in attendance for this special occasion. (L to R) Shavell Lucas, Robert Conery, Michael Hickmon, Mayor Kim McMillan, Thomas Harrison, Alyssa Wade, Nicholas Dejesus, ​Carl Jackson II and CPD Chief Al Ansley.